A tissue-like material capable of synchronised beating when heated and cooled has been developed by a team of University of Bristol chemists. 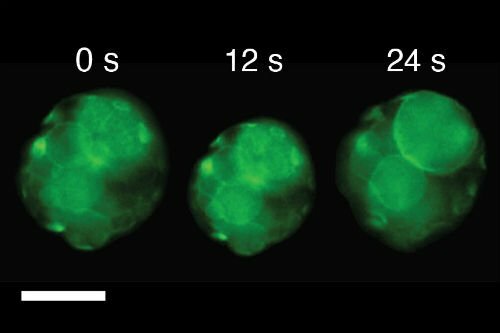 A team, led by Professor Stephen Mann FRS and Dr Pierangelo Gobbo from Bristol’s School of Chemistry, chemically programmed artificial synthetic cells known as protocells to communicate and interact with each other in a highly co-ordinated way. The researchers constructed two types of artificial cells each having a protein-polymer membrane but with complementary surface anchoring groups. The team then assembled a mixture of the sticky artificial cells into chemically-linked clusters to produce self-supporting artificial tissue spheroids. By using a polymer that could expand or contract as the temperature was changed below or above 37 ⁰C, it was possible to make the artificial tissues undergo sustained beat-like oscillations in size. Dr Pierangelo Gobbo, lead author, added: "Our methodology opens up a route from the synthetic construction of individual protocells to the co-assembly and spatial integration of multi-protocellular structures. In this way, we can combine the specialisation of individual protocell types with the collective properties of the ensemble." The study was funded by NSERC Canada and EU Horizon 2020 grants. ‘Programmed assembly of synthetic protocells into thermoresponsive prototissues’ by P. Gobbo, A. Patil, M. Li, R. Harniman, W. Briscoe and S. Mann in Nature Materials.